This article was found in Gardening How To and we thought it was important information and should be passed along. There's something wonderful about planting bulbs. No matter how cold it is outside, you get a taste of spring when you kneel in the dirt to settle your future flowers into their new homes. You can already visualize your hard work paying off in a neighbor-stopping show of flowers after months of winter brown. Too bad our spring dreams are so often spoiled by hungry critters. Animals can detect fresh bulbs in the ground, and they'll head over to your newly dug beds for a tasty snack as soon as you go inside for a cup of coffee. Luckily, there are lots of things you can do to protect your bulbs. Here are a few tips that are both effective and nontoxic - they won't harm humans, pets, or wildlife. The easiest way to keep squirrels, deer, mice, and other creatures from eating your bulbs is to plant bulbs they don't like. Animals love the taste of tulips and crocuses far more than any other bulbs. Others, like daffodils, alliums, and fritillaries, taste or smell so awful that critters leave them alone. The bad news is, of course, that you'd have to go without tulips and crocuses to be truly safe from critters. And for a lot of gardeners, spring just isn't spring without these two beauties. If you're in this category, don't worry - you can still plant your favorites. You'll need to rig up a barriers to keep pests from digging up your bulbs. Once you've placed the bulbs, spread a length of chicken wire over the top of them, tucking the edges into the soil. Then cover everything with soil just like you normally would. The wire won't be visible, and the bulbs will easily send up shoots thought the spaces in the wire. Be sure to get rid of all your planting debris, especially any leftover bulb tunics, which smell good and will attract squirrels like crazy. A less tidy but equally effective strategy is to lay old window screens on top of your newly planted bulb beds. The screens are too heavy for squirrels to move and too difficult to dig through. But they allow for good air circulation and rainfall. Remove the screens after three or four weeks, when the new-bulb smell has dissipated and the ground has settled. Don't have screens? For smaller areas, use boards or pot bases weighted down with rocks to cover beds until curious squirrels have moved on to other things. Some gardeners skid barriers altogether and give their bulbs a protective suit of armor by dipping them in solutions like Bulb Guard and Propel. These products make bulbs taste and smell bad so that so that a wide range of critters, including squirrels, gophers, and voles, will leave the alone. Keep fall foraging squirrels away from bulbs by giving them other things to munch on. Feeders that offer peanuts or dried corn are a good choice. If you love tulips and don't want to worry about whether squirrels will devour your bulbs, try purchasing potted, pre-grown tulips in the spring. They are available at garden center once the weather warms up, these tulips will likely be safe from squirrels, who forage much less in spring than fall. Once they're in the ground, treat them like you would any other tulip in your garden. 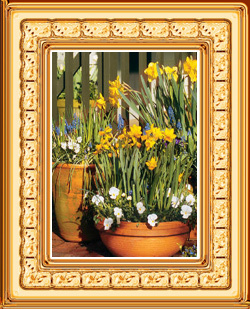 More information about "The Secret to Bulbs"
ulbs are a delight in any bed or border, but perform beautifully in pots and windowboxes. Whether you have a small garden, a large one that is out of room, or you simply prefer the ease and convenience of planter containers, you will love the color and impact they add. Success requires planning and attention, but the vivid results are worth the effort. Below are some tips on getting the best results. The size of the pottery container you use is determined by the number of bulbs you want to plant. Regardless of diameter, your container should have at least an 8" depth, with drain holes on the side if possible instead of the bottom. Self watering pots are NOT recommended. Soil should be light and loamy, well drained and moisture-retentive. Garden soil is NOT recommended. A soil-less blend comprised of sphagnum moss and vermiculite or perlite with some finished compost is ideal. A too wet condition is the most common cause for bulbs failing to bloom. For best drainage, line the plant container bottom with 1 - 2 inches of stone or broken pots. This helps to keep the soil from sitting in water. Plant a variety of early, mid season and late blooming bulbs in the same pot for an endless supply of color. After planting the bulbs in the pottery, water the container thoroughly. Don't allow soil to dry out completely during winter. If storing in a covered area, such as a shed or garage, water enough to maintain "barely moist" soil - about once a month. If you live in an area where winter temperatures regularly fall below 32 degrees, you will need to protect your potted bulbs from freezing. They do best when stored in a location that remains 32 to 45 degrees like an attached garage or unheated basement. If you live in an area where winter temps typically do not fall below 32 degrees, you can leave the containers outside with no special attention. Starting in the fall, select a pot at least 8" across. 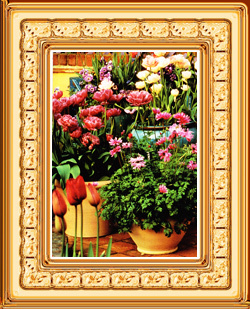 If the pot will be sitting on a deck or patio, select one at least 16" across. Terracotta pots will crack if they freeze, so use concrete, high fired ceramic, poly resin or fiberglass. They are all made to withstand cold temperatures. Large bulbs like tulips and daffodils should be about 8" deep, and smaller bulbs like hyacinth about 5" deep. Put a few inches of Miracle-Gro Moisture Control Potting MIx in the bottom of the pot to receive the first layer of bulbs. Place a layer of larger bulbs first. Plant close together, even touching for a nice effect. Place tulips with the flat side toward the outside of the pot so the first leaf will curl over the side. Tulips and daffodils and most other bulbs, are planted pointed side up. If you aren't sure, look for hairy root stubs and place them down. Add 3" of potting mix and plant a layer of smaller bulbs. 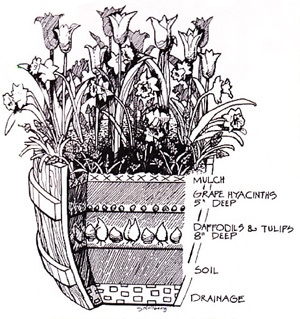 Add another 2" inches and plant dwarf iris if you are including them, then cover with a final 2" of soil. This should bring the soil to near the edge of the pot. Water the pot well and set it outside to chill. Spring flowering bulbs need a period of at least 10 weeks at temperatures around 45 degrees to trigger blooming. Place the pots where they will be in this temperature. This might be outside in the yard, or in an unheated garage or basement. If they are not exposed to rain or snow, check them every few weeks and water slightly if the soil is dry. Set outside as soon as shoots appear. Place them in full sun and let them grow. In a few weeks you will be rewarded with beautiful blooms. We hope you find this information useful. When it comes to getting the biggest bang for your buck in the garden or patio area - we want to make sure you all the information you need. Happy Planting!